When he starting bitching earlier about Tiger and wouldn’t stop, it would probably take a train wreck to bring his whining to a halt. And it took that much. He made the Fried Chicken comment. Sometime back, a guy called Fuzzy Zoeller (no, that’s not his pornstar name, it’s a real name, given by his father who obviously thought his son was a joke), made the same remark about Tiger, about serving fried chicken and collard greens. And we all know what happened. 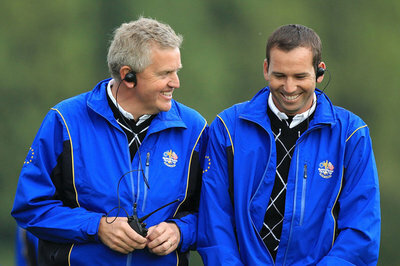 The world of golf descended into a racist pantomime for the next week or so. The Euro tour CEO George O’Grady first defends Sergio by saying, “A lot of Sergio’s pals are colored folks.” Or something of that nature. And boom, he lands into hot soup. Don’t say “colored”. It’s discriminatory. And now, the biggest idiot of all, a guy by the name of Colin Montgomerie steps in to defend both Sergio and George O’Grady by saying it’s a mountain out of a molehill. And he said, the European tour is a big happy family, he felt for Garcia and claims all this fried chicken talk is nonsense, and now everyone is afraid of saying something that isn’t ‘kosher’ in 2013. Now, we all know Colin Montgomerie is a racist. This is proven fact. So obviously he wouldn’t find anything wrong with calling Tiger the N word and eating fried chicken and collard beans. Colin Montgomerie is also overweight and diabetic, and impotent, although he cheats regularly on his wife by making out with a Scottish pig. Maybe you can understand a bit more on the furore your stupid lad Sergio Garcia caused across America by stating racist remarks. You might as well go to the next PGA tour event wearing a white hood and a burning cross. Seriously, Sergio and George, get educated. Colin Montgomerie, you never deserved to be in the Hall of Fame. You are a joke, a fat piece of crap who shouldn’t even be playing golf right now because you are such a hopeless loser. I agree with Tony Jacklin. If we allow Colin to be a hall of famer, then you might as well get anyone to be be a hall of famer. So, before making anymore remarks and showing how bigoted and racist you truly are, Colin Montgomerie, please do the world a favour and just disappear forever from the golfing landscape. Previous PostPrevious Did Tiger Take an Illegal Drop?